Food for Thought! : Anna Hazare Rises! – Why it is so important for the movement to become successful! Anna Hazare Rises! – Why it is so important for the movement to become successful! 1919, it was that time of the World history when First World War was going on. In India, the British Raj was intolerable. To worsen the situation, the Rowlatt Act was passed. The act authorized the government to imprison anybody suspected of conspiracy or promoting unrest without any trails and formalities. The very next year, General Dyer heard of major conspiracy that was going to happen among large gathering of people, then. He went with fifty armed men and ordered to open fire till the ammunitions lasted. It killed thousand of innocent Indians, including women and children. It was the Jallianwala Bagh massacre. Gandhiji launched Non-cooperation movement all over India propagating to boycott British goods and use of local made stuff, handicrafts, etc. The movement shook the very roots of British establishment in India. The movement was supported by Indian National Congress and freedom fighters like Bhagat Singh, Chandra Shekhar, Rajguru, etc. It could have given India independence in the early 1920s, had the movement been continued, then. In 1922, the Chauri Chaura incident happened where violent protest between local police and protestors resulted in setting police chowki on fire. It killed 22 policemen. Gandhi called off the non-cooperation movement since he was staunch believer of Ahimsa or non-violence. It took 25 years from then to get the Independence. It left many Indians including people like Bhagat Singh, Rajguru devastated. There was anger in the minds of common masses. Efforts were made to restore the non-cooperation movement. All in vain. The freedom fighter continued their struggle for the freedom in their own way. A ray of hope that Gandhi’s movement gave got killed. Today, we are Independent in a way that we have our own elected representatives to govern the nation. But the country has gone from bad to worse. Corruption appears to be a milder word these days, the way they happen are justified by the politicians in media. Tainted ministers head the committee and important portfolios. Land allotment scams, increase in FSI, Coalgate, spectrum scam, mining scam, buying of political support by tax payer’s money, misuse of development fund and the list goes on. The nation is divided into minority and majority to get the votes. The recent Assam violence is an example of how politics is played out with people for political gains. Last year, when Anna Hazare started with indefinite fast, it shook the roots of corrupt government. Efforts were made to curb the peaceful demonstration. False promises were made to pacify the anger. The huge support that Anna received showed that Indians were fed up of corrupt and incapable congress government. Government tried all that it could to weaken the force over the period of time. The movement gave a ray of hope to billions of Indians. Even I participated at the Gateway of India rally and witnessed several such peaceful demonstrations at various places. But if this revolution fails, it will kill hopes of million and no one else will dare to do what Anna is doing, in future. Everyone will fear to raise voice against unjust. People will fear from calling black, a black. It is really important for Anna Hazare and Indians to make this movement really large and successful. We need to come out of our homes and support whole-heartedly the movement. It is for our better future, for a better nation! fOoD fOr ThOuGhT:I know Anna Hazare won’t call off the movement the way Gandhi did, in 1922. More important is that people should realize and come forward to contribute towards the success of the movement to remain truly Independent. 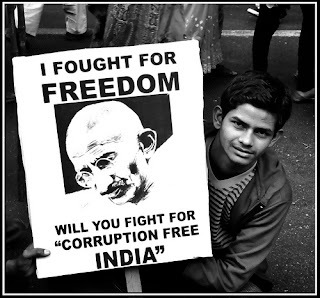 I agree dear Karan..though we have to support Anna...but we all have to fight our own battle too and try to stop corruption at all levels.. Thinks have reached the lowest level now and the enemy here is our own people whom we elected to represent us and not the British. The corruption has already made the roots of our democracy week. I think Anna Hazare cannot be the only man fighting for us. We need to stand with him to throw these corrupt politicians from our system. Vinita: Yes you are absolutely correct. But the problem is every other politician being corrupt, it is difficult to find a clean politician. Seeker: It will not achieve anything. The political parties always wanted Anna to join politics or form political party. Now that he has announced one, the happiest people are the very politicians. Beating them in their own game...Difficult!